I am attempting an OS Upgrade Windows 8.1 Pro -> Windows 10 Pro. ﻿2016-07-22 13:23:24, Error                 MOUPG  MoSetupPlatform: ExecuteCurrentOperations reported failure! Especially, it seems like the winre.wim image could not be mounted. I don't know what the matching file name in the souce folder is, so I am trying with the 273MB boot.wim. Error is reported to be with SetFileSize. There is plenty of free space, also, I checked that the path in total is only 128 chars for that file. I assume this is the very same error I have with the OS upgrade. Falscher Parameter means Invalid Parameter. Mount with same syntax and files at same position on 2 other Win 8.1 Pro systems works (German and English versions). How can I fix the dism/wim in order to allow mounting images again? If you manage to completely install Windows 10, there are 2 times where Setup counts up in percent. The first time it counts up, before the reboot, it copies the necessary setup files, and round about 23%, it mounts an image using dism/wim. Looking at the setup logfile, I saw problems with image mounting. 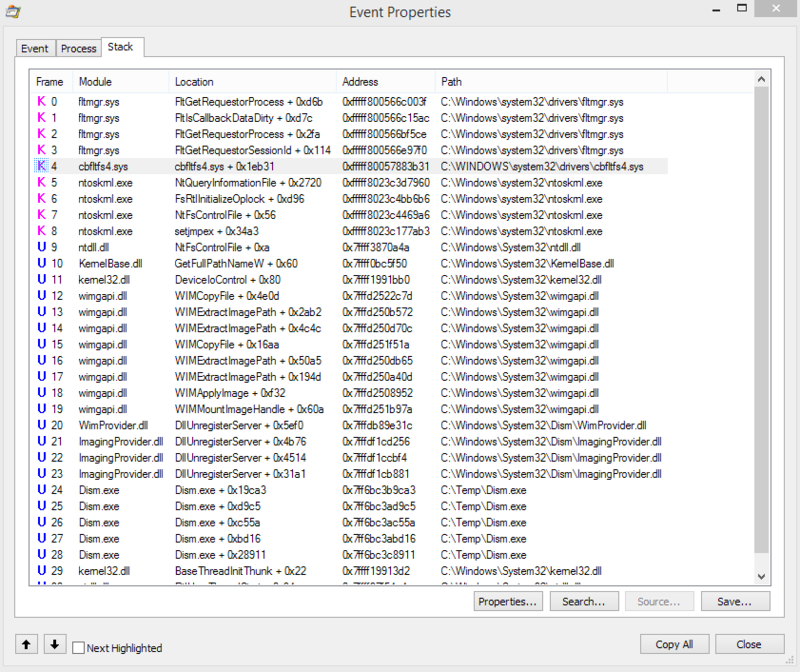 Using Sysinternal's Process Monitor I could record dism.exe's actions and compare them to the desired ones. I noticed that the failed action (SetFileSize) occured once in the working mounting case, and twice in the failing one. I looked at the stacktrace of the failing action and saw that there was one additional call, in filter driver cbftlsfs4.sys. Some googling revealed that this file belongs to Cloudfogger. Uninstalling Cloudfogger (I moved to viivo some time ago after having different issues with Cloudfogger, so uninstalling was no issue) removed both the filter driver as well as the mounting problem. The Windows 10 upgrade worked afterwards. Probably, few people have this exact same issue. On a different machine, with an older version of Cloudfogger, I did not have this issue. For me, it was 2 days of work and investigation, and perhaps this is helpful to someone else, so I wrote down my steps in so much detail. As part of the disucssion there are 2 .bat files posted - look at what is inside them and run yourself or use them directly. Not the answer you're looking for? Browse other questions tagged windows-10 windows-8.1 windows-10-upgrade dism or ask your own question. Can you mount a .wim image using DISM?